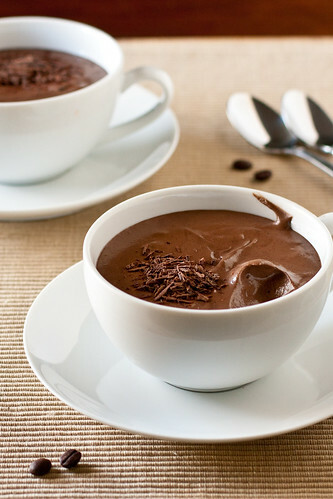 Soft, creamy, chocolate mousse. Smooth, almost pudding-like, chocolate mousse. Rich, super chocolatey mousse. If you’ve never tried it, it’s unbelievably easy to make at home. You crack some eggs. You melt some chocolate. You whip some cream. You have a fantastic dessert that’s perfect for date night, Valentine’s Day, or my favorite reason: just because. Rich and creamy chocolate mousse couldn't be easier to make! Set a glass bowl over a pot of simmering water. Whisk the egg yolks, sugar, salt, and espresso until the mixture is very warm and the sugar has completely dissolved (rub a bit between your fingers to check that there are no granules). Add the cocoa and chocolate and whisk until almost melted. Remove the bowl from the pot and set aside. Whisk until completely melted and then let cool to room temperature/slightly warm. Whip heavy cream until soft peaks form. Add half of the whipped cream to the bowl of chocolate and fold with a rubber spatula until mostly combined. Add the remaining whipped cream and fold until completely combined. Divide the mousse among 2 small dessert dishes. Cover with plastic wrap and chill for at least 2 hours (and up to 1 day). (I cut a paper towel in half and covered the top of the dish, not touching the mousse, before wrapping - this will catch any condensation drips that might form on the plastic wrap before they drip on the top of your pretty mousse). Remove from the fridge 15 minutes prior to serving. Garnish with chocolate shavings or additional whipped cream. I want to take a spoon and grab some through my computer! Oooh yes please! Love the addition of the espresso…and obviously the dark chocolate. And we’ll probably need to double the recipe. We’re terribly greedy like that. I love chocolate mousse. The richer the better! I cannot wait to try this. Chocolate Mousse has always been so intimidating, you’ve made it accessible. I remember in Paris as a kid being thrilled with the giant vats of chocolate mousse…pure heaven. Wow, this looks awesome. 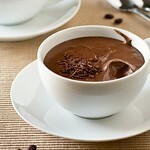 I’ve never made mousse before and must try it soon! And your photos look killer. Truly, incredible! Is this natural light? Just found you through Tastespotting. What a gorgeous blog! I so want that right now. OMG. This seems to be a divine mousse. Cant resist to make and have my share soon… ! This looks soooo good! You’ve inspired me to make some. Thanks for the recipe. This is definitely my kind of dessert – chocolate and coffee! YUM! oh my..love the presentation, looks like super thick hot chocolate! Hello!, First time poster and looking forward to being a part of the conversation . This reminds me of the Spanish café drinks. The thick chocolate drink is unusual but one of the best. Great post. This is close to a mousse an old friend used to make for all of us,but I don’t have a idea how to make it. 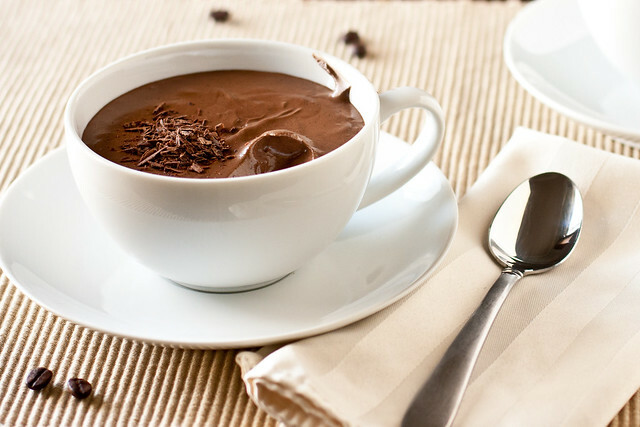 She added this twist….She soaked Lady Fingers in some liquor, Bourbon perhaps and the coffee then lined them up against the inner wall of a large slanted mixing bowl …then poured the mousse in the middle and filed up the bowl. I believe she would let it sit in the frig for quite a while. The lady fingers were completely soaked with the coffer ,bourbon,and chocolate also by the time it was ready to serve. She was sure to go all the way to the bottom of the bowl when serving this to us. We would fight to get the most of that bottom of that bowl… ..the best desert I have ever had any where. What do you think?Have you seen anything like this desert before? I’ve never had anything like that before – but it sounds absolutely magical! That chocolate mousse looks amazing!!! Mmmm-mmmmm I wish I had some right now! PLEASE REPLY! THANKS IN ADVANCE! Multiplying everything by 5 will get you ten 1/2-cup servings (the original recipe serves 2) or 5 1-cup servings. You should be able to get away with just tripling the recipe to serve 5 people – but it really does depend on how large of a serving you want. This looks like a dessert I had last night at the Elephant Bar. It was served warm with vanilla ice cream and whipped cream. Can this be re-heated? I do not think it would do well reheated. Definitely trying this, and thanks for the great tip about the paper towel under the plastic wrap!